Domestic legal sports betting is sweeping this nation after the U.S. Supreme Court repeal of PASPA, the federal law preventing states from legalizing gambling on sports. Football is the most bet on sport in the United States with an estimated $100 billion to be wagered on NFL and college football each year. While football fans from all states except Washington and Connecticut can legally place bets at licensed and regulated offshore sportsbooks, we wanted to take a closer look at the situation with US-based sports betting. You can get more information about licensed online football betting sites to find out which destinations cater to US bettors. Delaware – On June 5, 2018, Delaware became the first state to launch legal sports betting following the repeal of PASPA, allowing bets to be placed at three Delaware-based casinos: Delaware Park, Dover Downs, and Harrington Raceway. Gambling research experts are predicting Delaware sports betting to generate at least $23.1 million in annual revenue for the state and when including online, as much as $49.6 million in annual revenue – most of which is expected to come from betting on NFL and college football. Mississippi – Following the PASPA repeal, Mississippi became the third state and first state in the South to launch legal sports betting on August 1, 2018, with the first bets being placed at the Beau Rivage and Gold Strike Casino Resort. Mississippi currently requires all football bets to be placed in person with legislation regarding the operation of online sportsbooks within state lines to be voted on at a later date. Nevada – Before the PASPA repeal, Nevada was the only state permitted to offer full-blown legal betting on football centered around its Las Vegas gambling market, which had existed for decades prior to the law being enacted. In fact, a record $158.58 million was bet on Super Bowl LII at Nevada sportsbooks in 2018. Many states are expected to examine Nevada’s gambling laws and find the best regulations that apply to their state regarding gambling oversight, integrity, and management. New Jersey – New Jersey became the second state to launch legal sports betting following the PASPA repeal on June 14, 2018 with the first bets placed at Monmouth Park. In addition, DraftKings Inc., the world’s most popular daily fantasy football company, launched the DraftKings Sportsbook app, the first legal online sportsbook in the country on August 1, 2018, allowing New Jersey residents and visitors to place wagers on the 2018 NFL and college football season. New Mexico - A New Mexico tribal casino started accepting bets on sporting events in October of 2018. Since there is no federal ban on sports betting tribal casinos in New Mexico are allowed to offer domestic sports betting through their gaming agreements with the state. More NM tribal casinos are expected to have sports betting operations in place by the end of 2018. New York - New York currently allows Daily Fantasy Sports (DFS) betting. Recent efforts to legalize sports betting across the state has failed but will likely reappear in 2019. Pennsylvania – Pennsylvania approved legal sports betting in 2017 and with the repeal of PASPA. Sports betting officially launched on November 15th, 2018. The Hollywood Casino at Penn National Race Course was the first establishment to start accepting bets on sports. Rhode Island – Governor Gina Raimondo signed the state budget on June 22, 2018, giving the Lincoln and Tiverton Twin Rivers Casino locations the exclusive rights to brick-and-mortar sportsbooks in the state. Rhode Island became the 7th state to launch domestic sports betting on November 26th, 2018. West Virginia – On August 30, 2018, West Virginia became the fourth state to offer legal sports betting following the repeal of PASPA when the first bets were placed at the Hollywood Casino. West Virginia was the last state to permit wagering on NFL and college football before both fully kicked off their 2018 seasons. All other states will have to vote on legislation during or after the 2018 NFL and college football season. Arkansas - Voters passed Issue 4 in the 2018 Midterm elections. The amendment makes sports betting legal throughout the state and approves 4 licenses for casino style gaming establishments. The following states, including Washington D.C., have either presented football betting bills that did not pass in previous legislative cycles, are expected to present those bills that previously did not pass in the next legislative cycle or are expected to introduce football betting legislation for the first time. 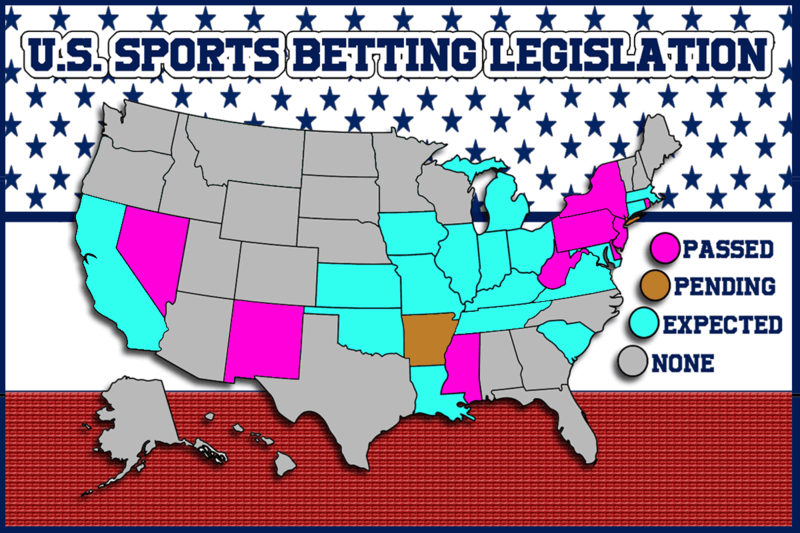 The following states have laws prohibiting the wagering on football at brick-and-mortar locations in state lines and have not publicly announced any plans to legalize betting on football.